miso 2 Tbsp. 2 Tbsp. sugar 2½ Tbsp. 2½ Tbsp. soy sauce 1 tsp. 1 tsp. sesame seeds, unhulled 3 Tbsp. 3 Tbsp. 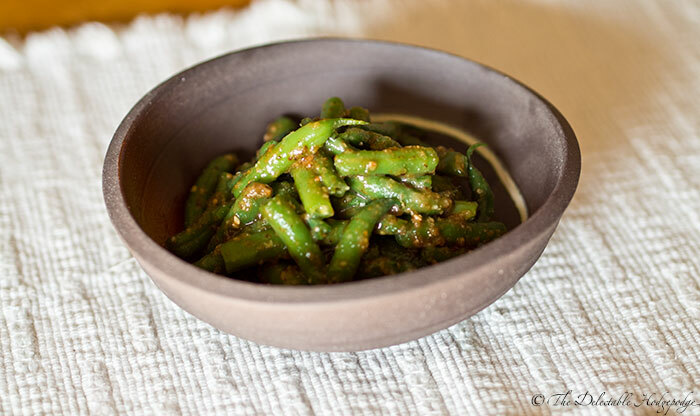 This Japanese-style green bean dish is so simple to make it’s hard to believe how delicious it is. The sweet miso flavor elevates slightly crunchy green beans into something entirely different and absolutely irresistible. Serve as a Western-style side with just about anything, or Japanese style as one of the small side dishes with white rice. If the green beans you’re using have a string down the seam, snap off a bit of each end of each bean with your fingers and pull off the string with it, then discard. If they are the stringless kind that are becoming more common, just use a knife to cut a bit of the tops off; there is no need to remove the pointy bottom ends. Bring a pot of water to a boil. Add a pinch of salt, then the beans. Boil for about 2 minutes, until just tender. Drain the cooked beans and immediately put them in a bowl of ice water. If you don’t have ice available, use cold water, then drain and refill with cold water a couple of times. After beans have cooled, drain immediately and dry thoroughly using paper towels. Toast and grind sesame seeds. Toast the sesame seeds over low heat in a dry, stainless steel or iron pan (do not use a nonstick pan) until fragrant. Coarsely grind them with a mortar or spice grinder. In a saucepan, mix miso, sugar, and soy sauce. Heat over high, stirring constantly, until it begins to look shiny, then remove from heat. The high heat creates the shiny texture. Add ground sesame seeds to the sauce and mix. Cut beans into pieces about 1-1½ inch (3-4cm) long. Mix with the sauce to coat and serve. The beans will produce some liquid once the sauce is added, so it is best to wait until you’re ready to serve it to add the sauce. In the US sesame seeds are often sold hulled (with the outer shell removed); this recipe uses unhulled or “natural” type that have the hull on. Whole toasted sesame seeds keep well if stored in a sealed container in the refrigerator, so you can toast extra and save them for future use. This site and all recipes and images copyright © 2008-2018 A.F. Marshall. Site by Alternate World Publishing.